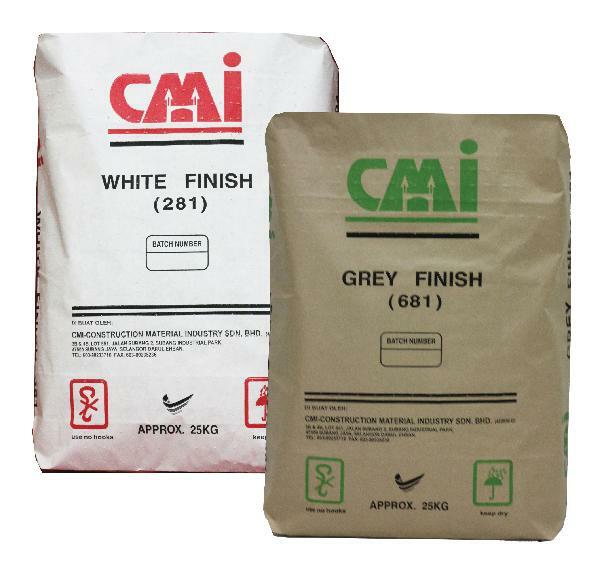 CMI FINISH COAT PLASTER 281 & 681 | CMI Marketing Sdn. Bhd. CMI FINISH-COAT is a high quality polymer modified water-resistant cement-based thin plaster for finishing on wall and ceilings. CMI FINISH-COAT can be used on CMI BASE-MORTAR, concrete and rendered surfaces to give a high quality plaster surface suitable for either painting or wallpapering. CMI FINISH-COAT should not be used on painted surfaces. CoIour/ Binder : White/ Grey Cement. Coverage : Approximately 1.2 kg/ m2 / mm thick. Recommended thickness : 1 – 2 mm per coat. Density : Dry 1 1.3 kg / litre ; Wet 1 1.6 kg/ litre. Mixing ratio : Approximately 45% water on dry material. adhesion. Where necessary, dampen the dry concrete or rendered surfaces before application of CMI FINISH-COAT.